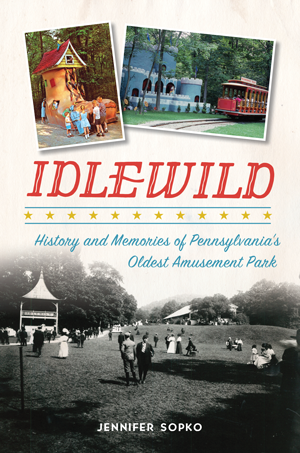 Idlewild and SoakZone has charmed people across Western Pennsylvania and beyond since the late 1800s. The park was developed by Pittsburgh's Mellon family as a picnic grove to boost traffic on the Ligonier Valley Rail Road. When C.C. Macdonald took the helm in 1931, rides, entertainment and other attractions came to Idlewild over the next half century, along with the adjacent Story Book Forest. After joining the Kennywood family of amusement parks, Idlewild added a Wild West town, Mister Rogers' Neighborhood of Make-Believe and a water slide complex. Author Jennifer Sopko tells the heartwarming history of a Pennsylvania amusement park that continues to delight generations of families. Jennifer Sopko is a writer and historian with a love of Pennsylvania history. Since 2003, she has written about the Ligonier Valley, Westmoreland County and Western Pennsylvania for several regional publications, including the Latrobe Bulletin, the Ligonier Echo, Westmoreland History magazine and Western Pennsylvania magazine. Her first book, Ligonier Valley Vignettes: Tales from the Laurel Highlands, a series of historical vignettes about Pennsylvania's Ligonier Valley, was published by The History Press in 2013. She is the co-chair for the Westmoreland County Historical Society's 2015 and 2016 annual fundraisers and regularly helps in the Ligonier Valley Library's Pennsylvania Room, where in 2009 she was guest curator for a historical photo and memorabilia show about Pennsylvania drive-in theaters. She also enjoys playing flute with the Penn-Trafford Community Flute Choir and the Penn-Trafford Community Band.